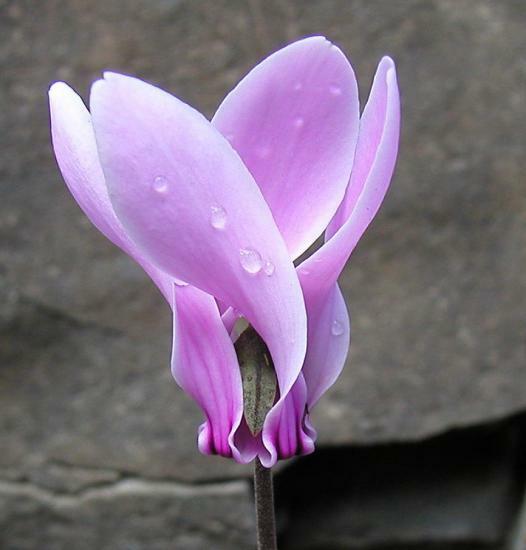 Cyclamen species G through H are found on this wiki page. 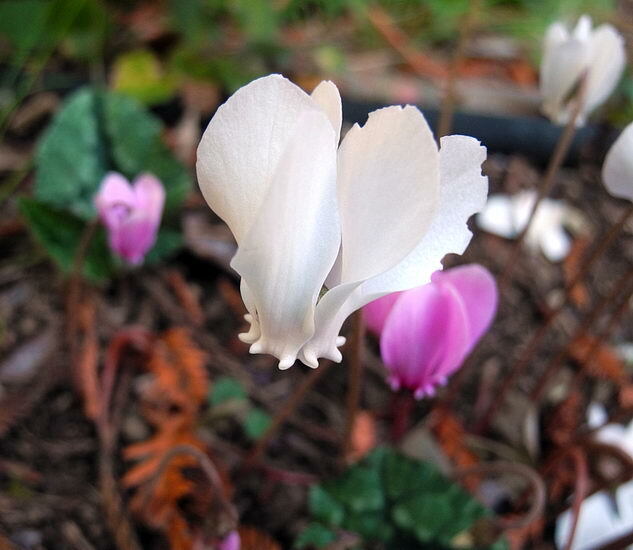 Cyclamen graecum Link is an interesting and charming autumn-flowering species that forms an entity of its own, with several characters that are unique to the genus. 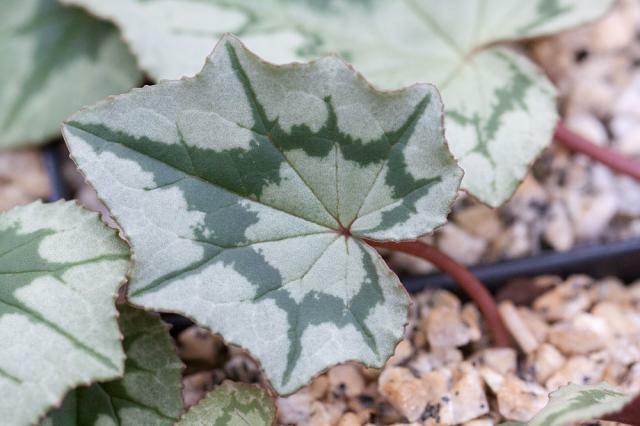 It is grown for its autumn flowers as well as for its handsome and often striking foliage, which comes in a great range of patterning and coloring. 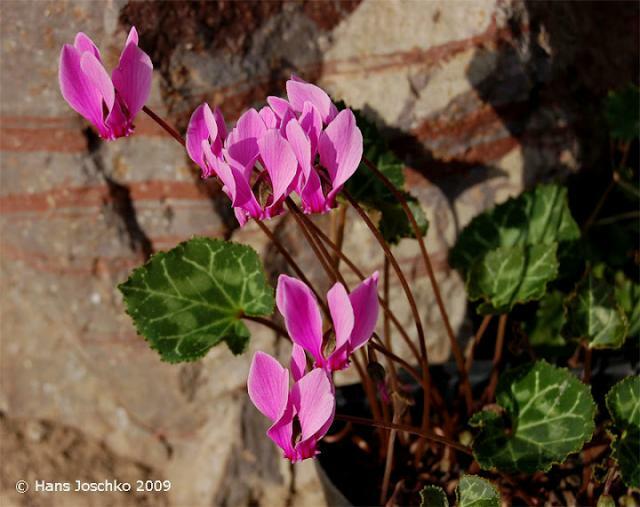 It is native to southern Greece, the Greek Islands, southern Turkey and Cyprus and blooms from September to November and has pale to deep pink flowers with 3 magenta pencil-line streaks at the base of each petal and auricles around the mouth. 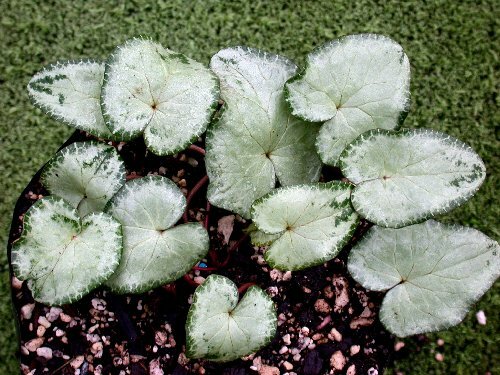 The leaf margin is usually unlobed but finely toothed with a beaded feel which helps distinguish it from Cyclamen hederifolium with which it is sometimes confused. Another difference is the markings at the base. 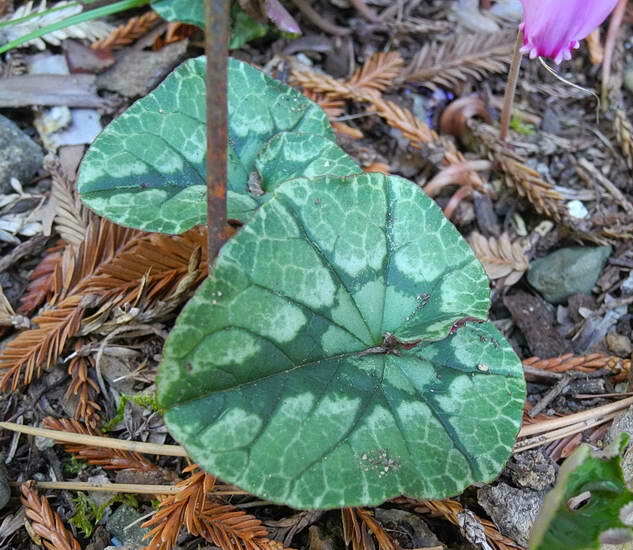 Cyclamen hederifolium has two broad v-shaped marks and C. graecum pencil line thin marks with a single thin line between them. 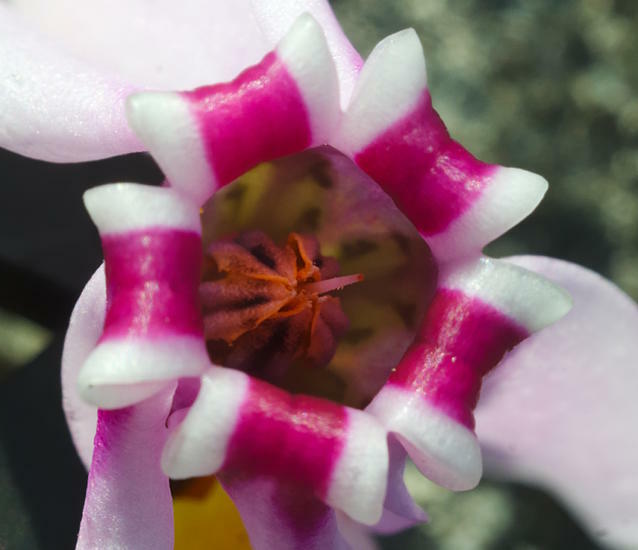 Some populations also have a more substantial color that may extend up the petal. 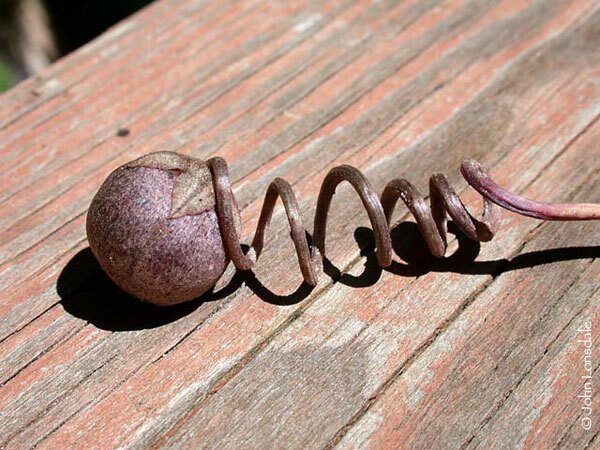 The fruit stalks twist in two directions from the center. 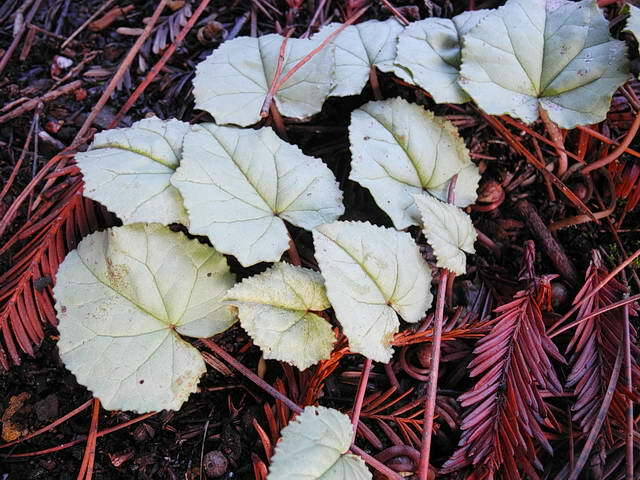 Photos by Mary Sue Ittner showing flowers and leaves. 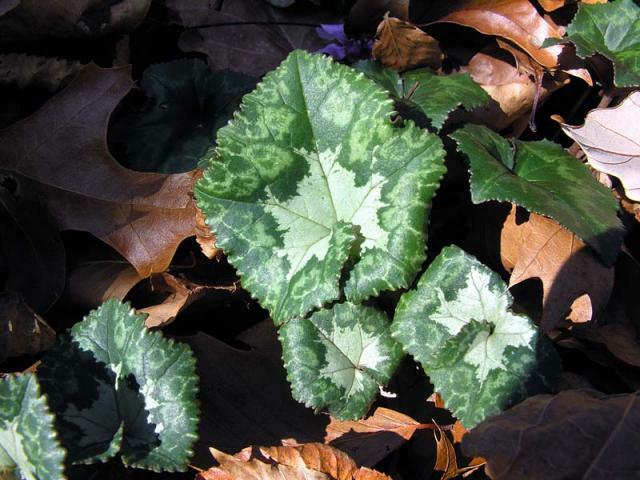 The leaves change even in the same season (but also from season to season as the plant matures). 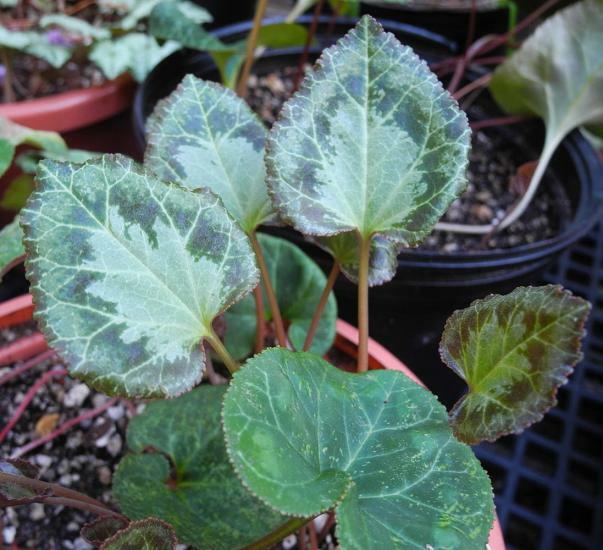 The last three photos show the same plant with new leaves starting out with a brown tinge that has faded in the next photo. 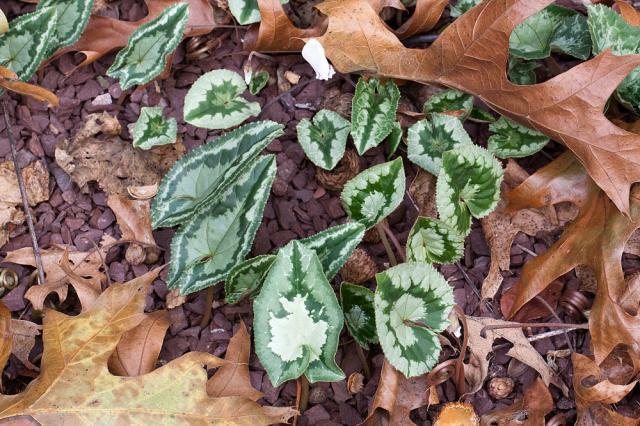 In the last there are an assortment of colors to the leaves including a new darker one on the right and others that are now green. 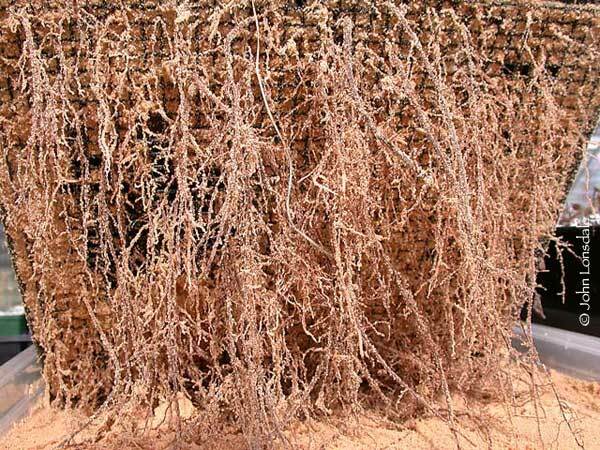 The tuber is globose and fleshy, up to 30 cm (12 in) in diameter, becoming rough, corky and fissured when mature, and rooting from the center of the base. 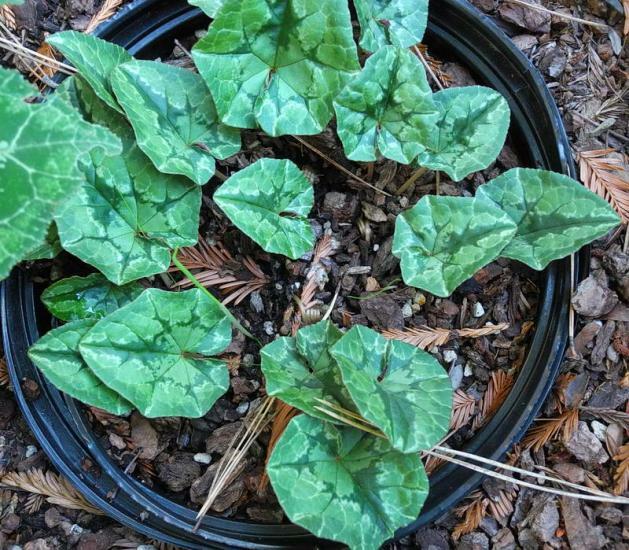 Photos below show tubers can get even bigger. 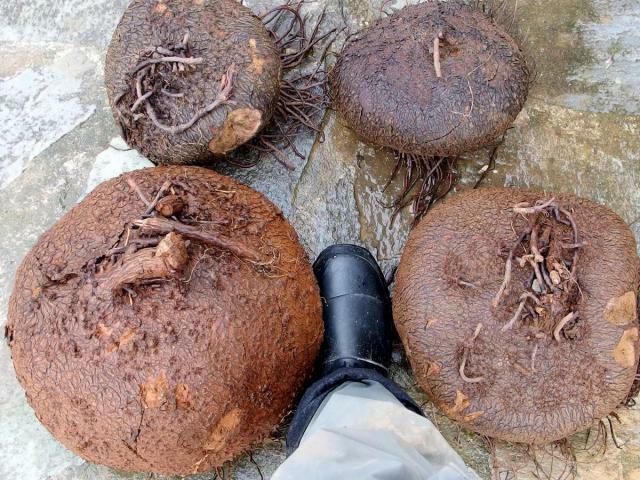 There are two kinds of roots, fine and fibrous, and thick, fleshy, and thong-like anchor roots. 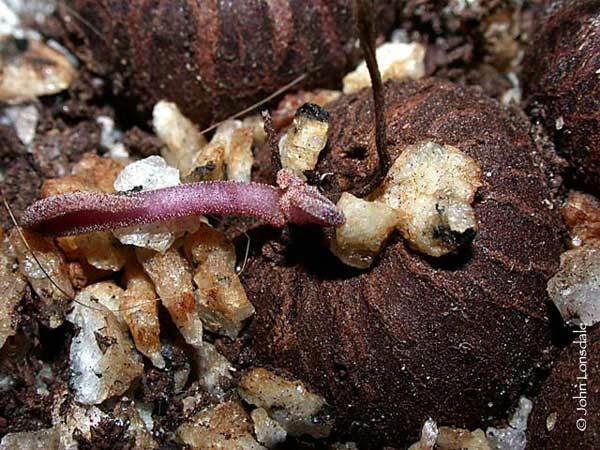 The first photo from John Lonsdale shows the stem on an reawakening tuber and the second the fibrous roots. 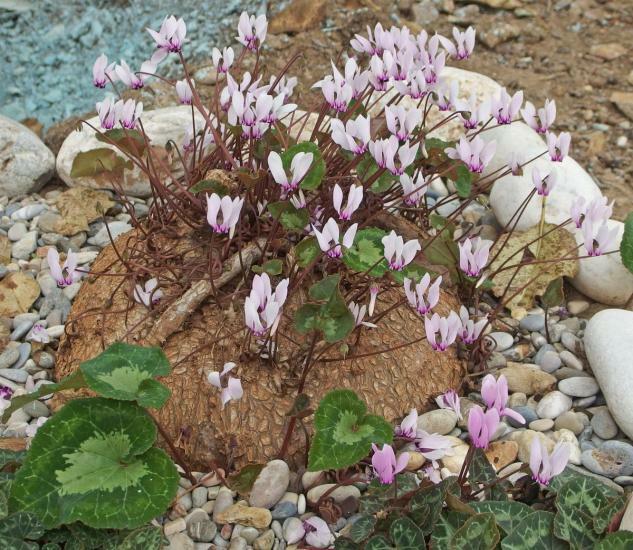 The other photographs by Stavroula Ventouri and Stavros Apostolou are of tubers growing in Arcadia (Αρκαδία) on the Peloponnese peninsula close to the sea. 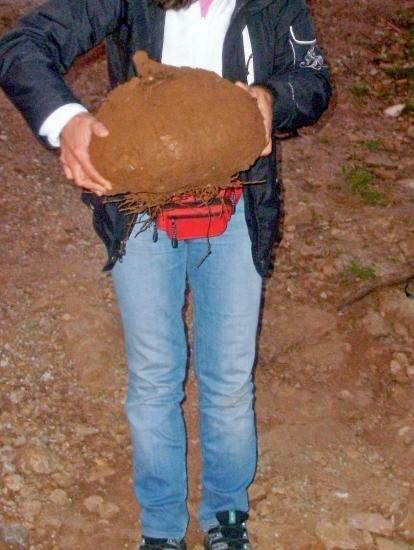 The largest weighed at least 17.5 kg with a height of 23 cm and a circumference of 99 cm. 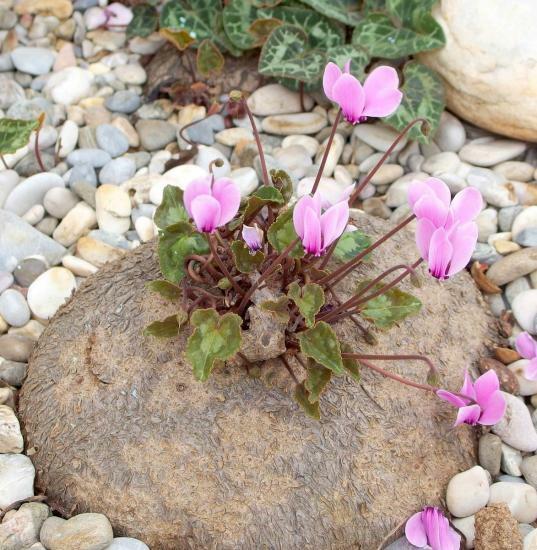 The full story may be read in International Rock Gardener, December 2014. 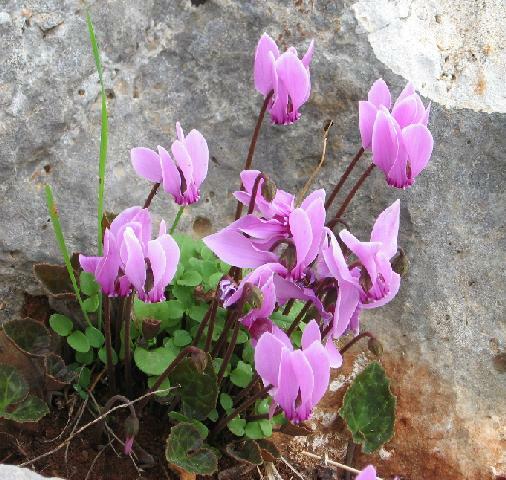 The populations of Cyclamen graecum on the Mani Peninsula in the Peloponnese region of southern Greece are notable for large flowers and leaves and strong coloration. 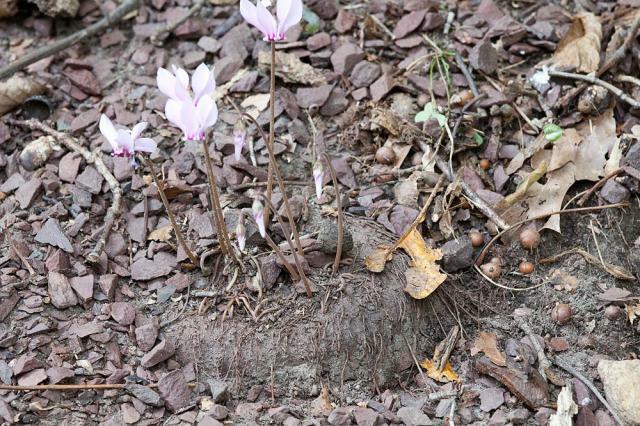 The first three photos were taken by Jane McGary at the end of October in that area, where the plants grow mostly in open areas in rocky soil. 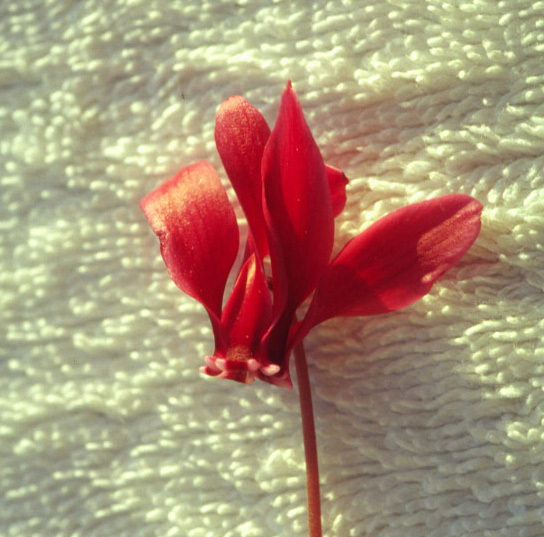 Photo two shows a large plant in flower in a newly burned area. 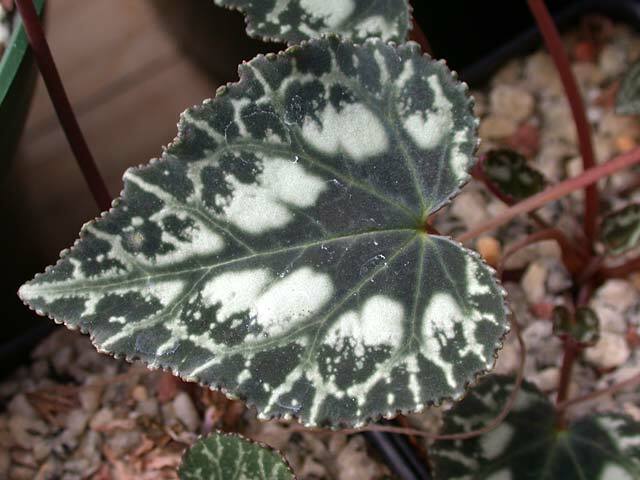 Photo three shows "cochleate" leaves resembling those of some begonias. 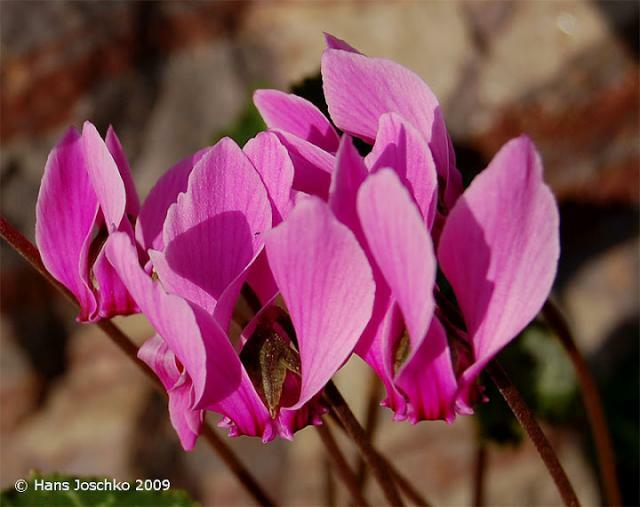 The last two photos from Hans Joschko. 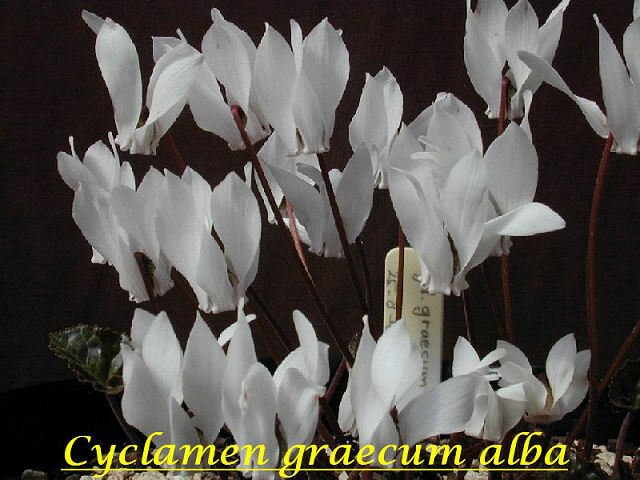 Cyclamen graecum ssp. 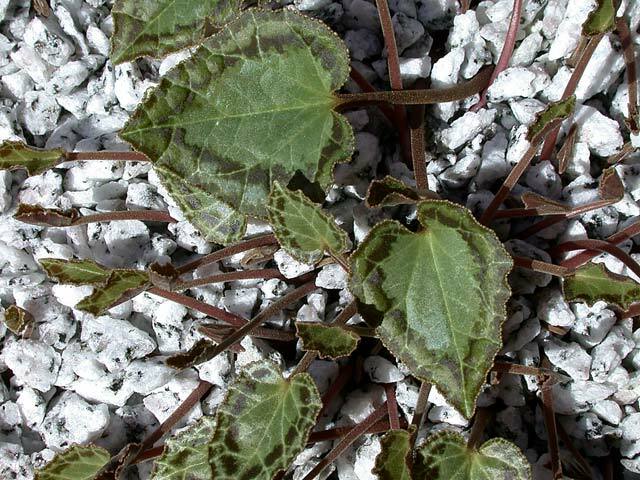 anatolicum Ietsw. 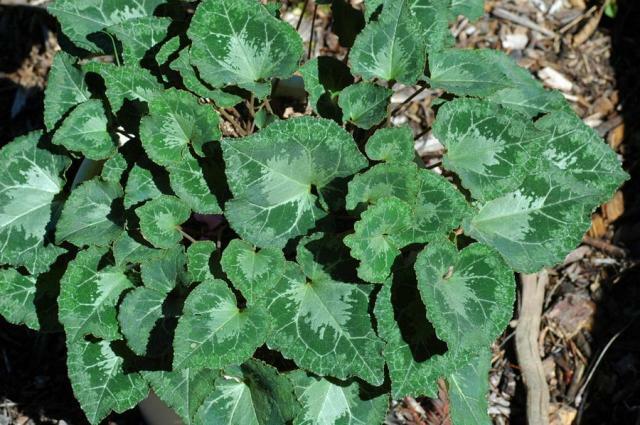 is found in Turkey, Rhodes, and Cyprus where it grows in woodland or scrub in sandy and rocky places. 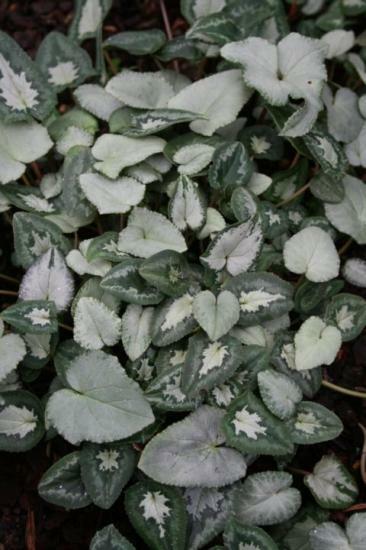 It has leaves with beaded and lobed margins, green but often marked with a pale central zone in paler green, pewter or silver. 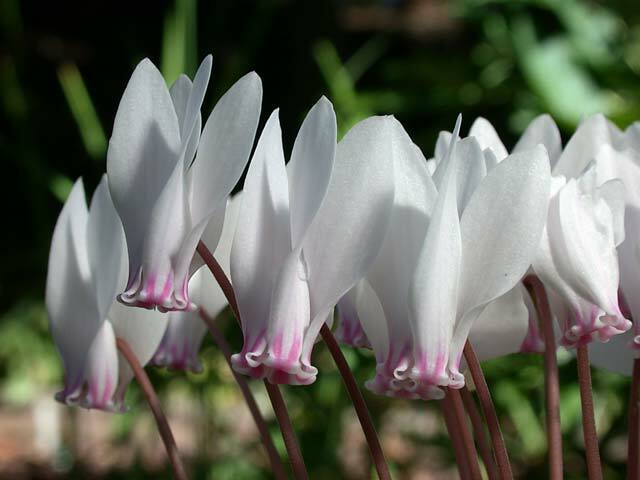 The white to pink sweetly scented flowers have small poorly developed auricles and dark basal solid blotches at the base of each petal that do not usually extend along the veins. The first photo from Hans Joschko. 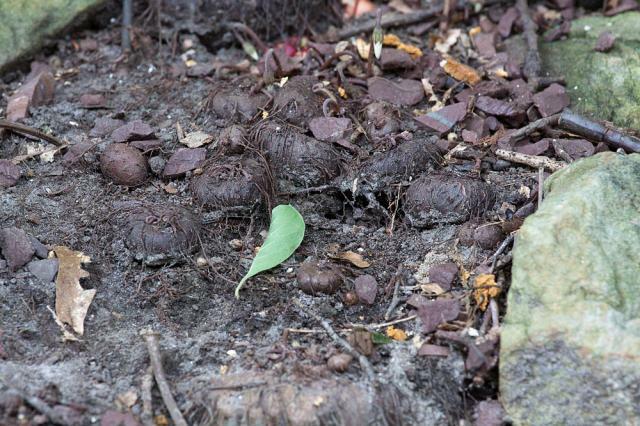 The second photo from Mary Sue Ittner shows a tuber on a 1 cm grid and illustrates the anchor roots. Other photos from John Lonsdale. 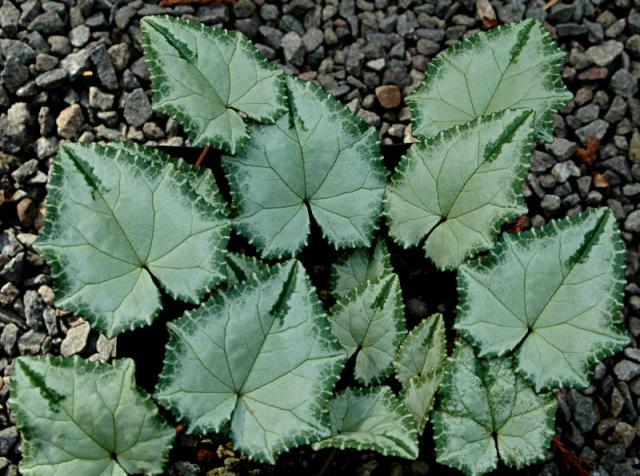 Some of the different beautiful leaf patterns are illustrated below. Photos from John Lonsdale. 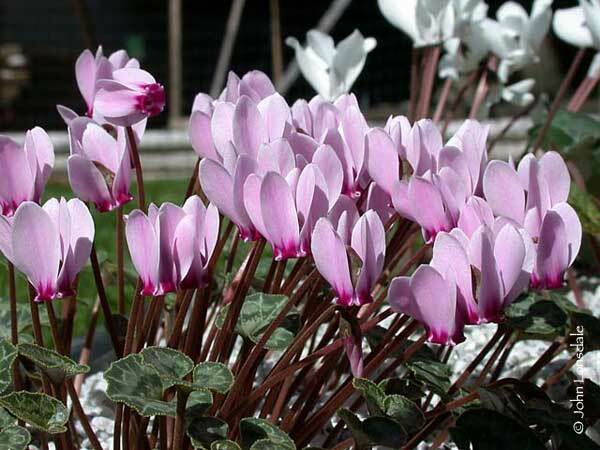 Cyclamen graecum ssp. 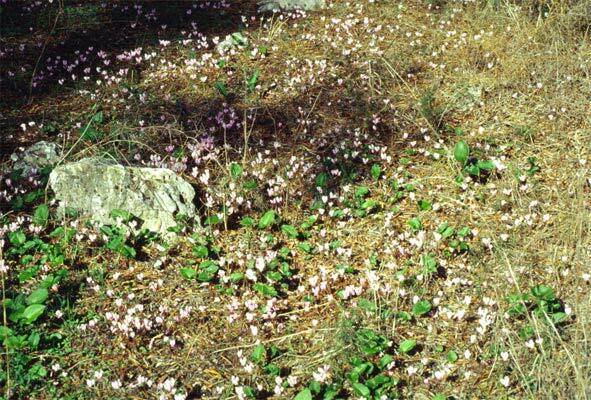 graecum is found on mainland Greece and some of the Islands where it grows on hilly and mountain slopes in loamy rock pockets or crevices. 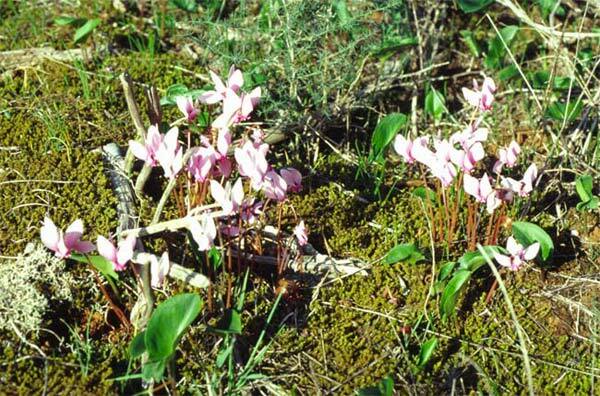 It has ovate leaves that are green or grey-green and unlobed with the lower surface sometimes flushed pink or purple. 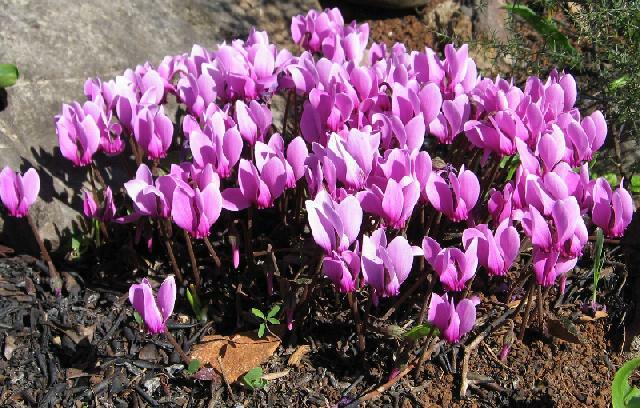 The pink flowers with well-developed auricles are mostly unscented and marked with a basal blotch that extends along the veins. 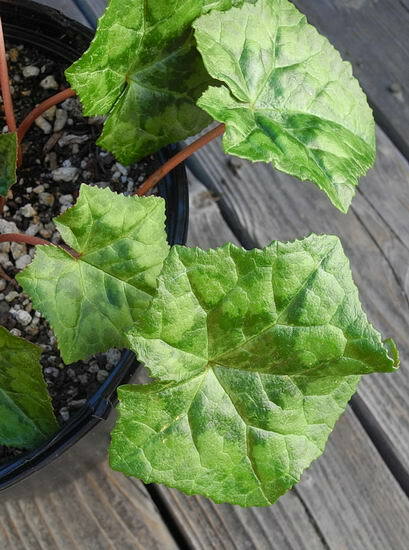 Flowers appear above, or before the wonderfully patterned leaves. Photos by John Lonsdale. 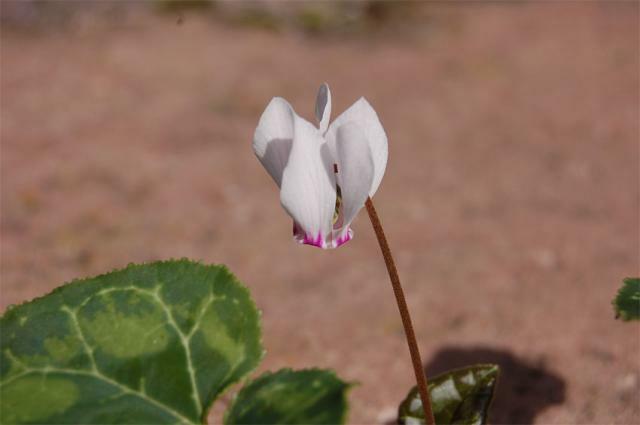 Cyclamen graecum ssp. 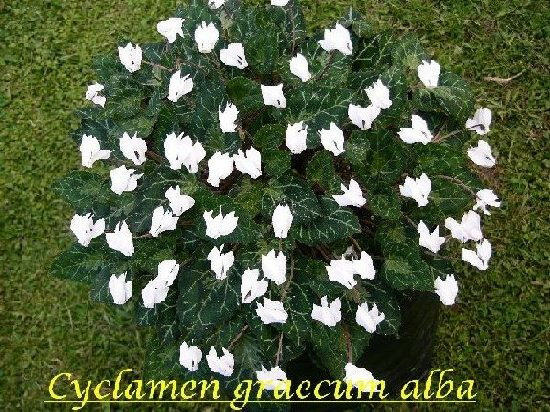 graecum forma album This beautiful white flowered form of Cyclamen graecum, is an exquisite plant, and as easy to grow as the normal pink ones. 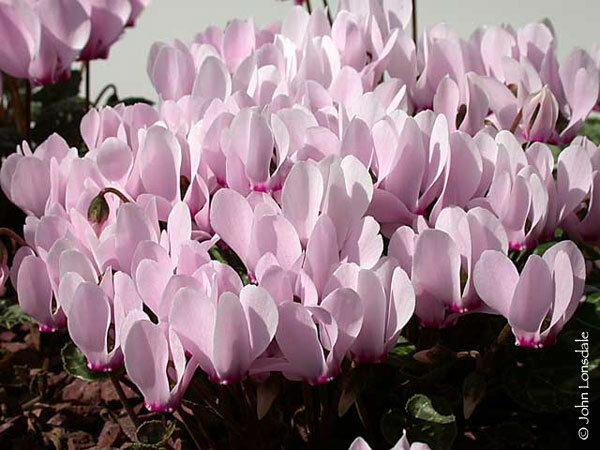 A good plant can produce in excess of 100 blooms and is a truly arresting sight in full flower. 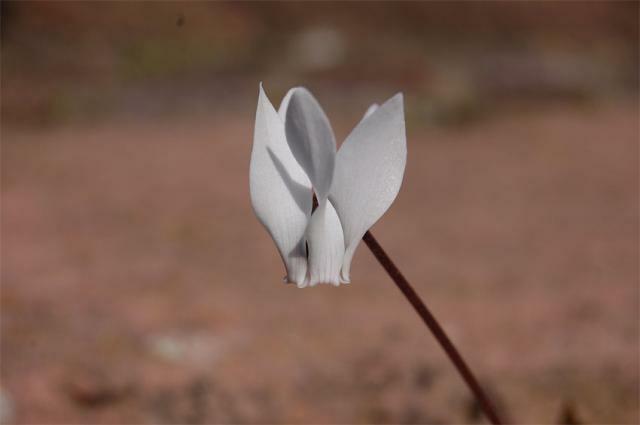 This rare white flowered plant was only found in 1980 in the Greek Peloponnese. 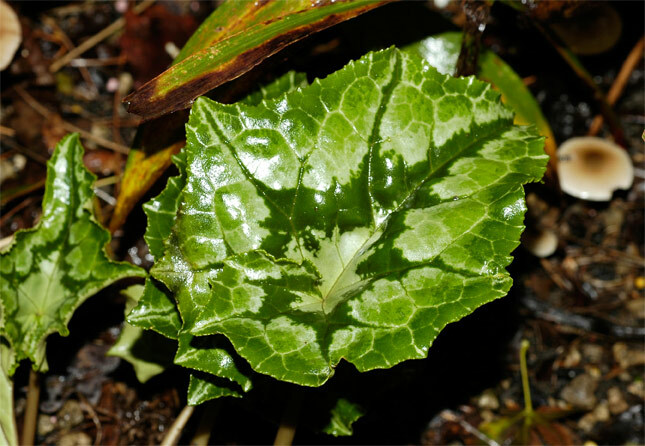 It has been stated that this particular species requires a long summer baking in order to perform well and a warm, secluded and sheltered site should be chosen. 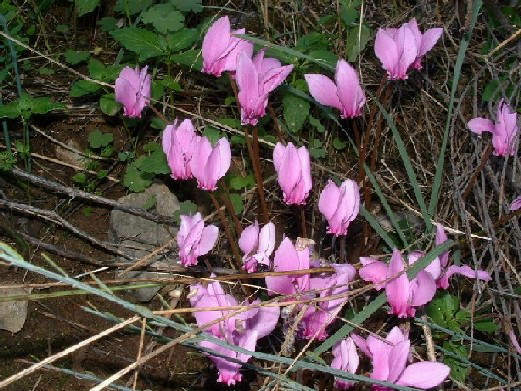 As an interesting BTW, Mr. Christopher Grey-Wilson mentioned in his Cyclamen book that in the Autumn of 1992 he was in the company of Jack Elliott whilst leading a Field Studies Council expedition to the Peloponnese. 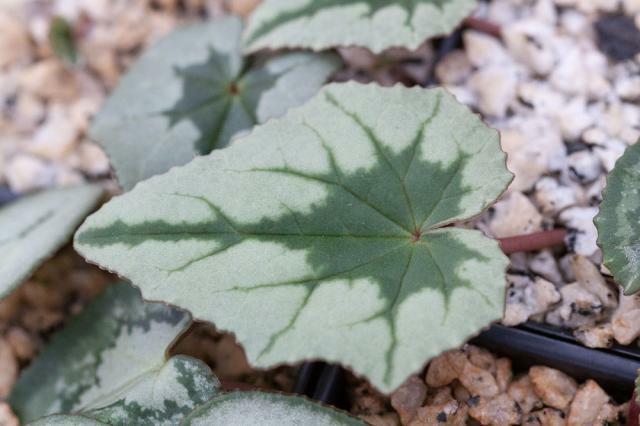 The previous day he said they had been remarking that the pure white C. graecum seemed to be extremely scarce, and that it must be pure luck to come upon one. The following day, on the outskirts of Gythion, the first and only white C. graecum was spotted, but they never saw another one like it in the following ten days, search as they might. The first photo was taken by John Lonsdale, the second and third by [~Bill Dijk]], and the last photo from Hans Joschko. 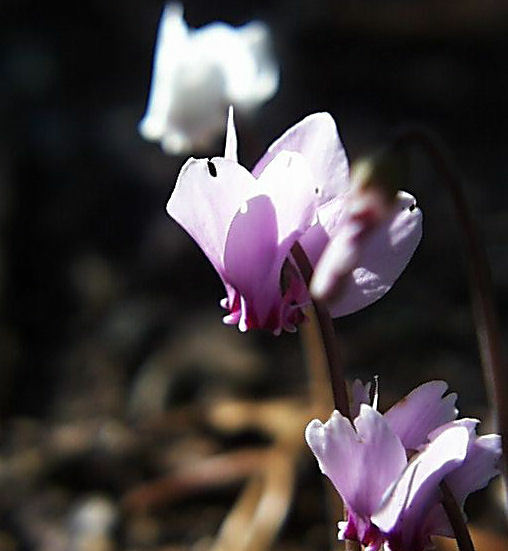 Cyclamen graecum ssp. mindleri (Heldr.) A.Davis & Govaerts, syn. 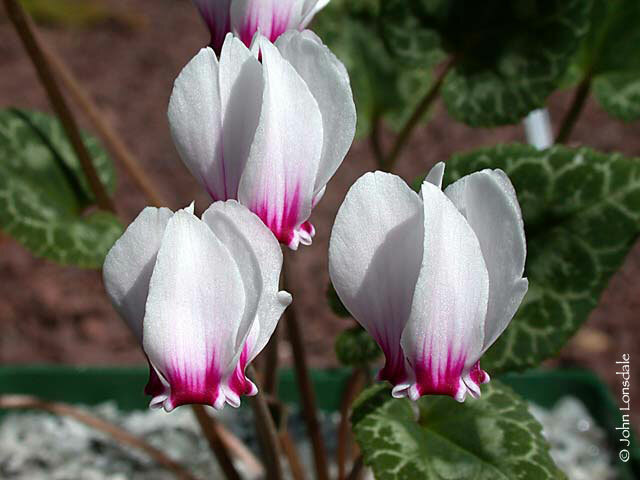 Cyclamen graecum ssp. 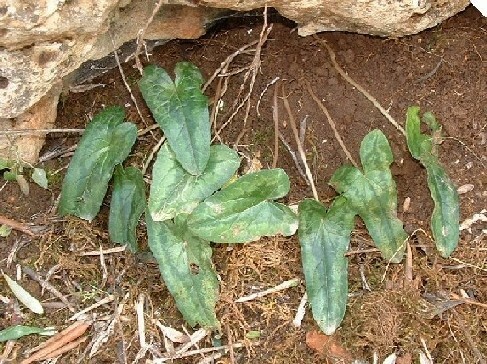 candicum Ietsw., is from the White Mountains of Western Crete. 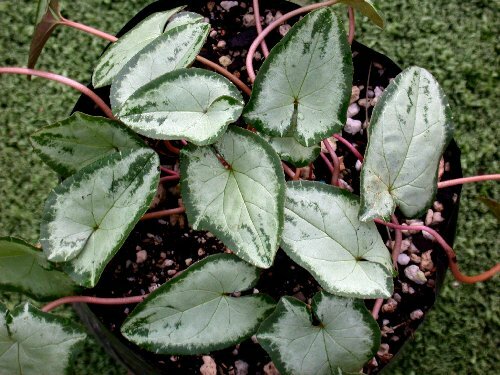 It has smaller, white to pale pink, broad mouthed flowers with well-marked auricles and a solid blackish purple basal blotch on the lobes that extends along the veins above compact dark, pointed foliage that is often intricately marbled and reddish purple or crimson beneath. The first four photos by John Lonsdale and the last by Hans Joschko. 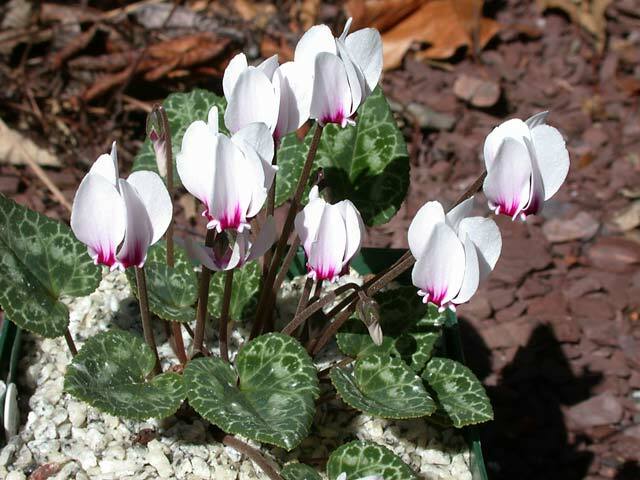 Cyclamen hederifolium Aiton is distributed in southern Europe where it grows in woodland and scrub, in ravines and gullies or on banks or crevices of walls or cliffs, usually, but not always in dappled shade. 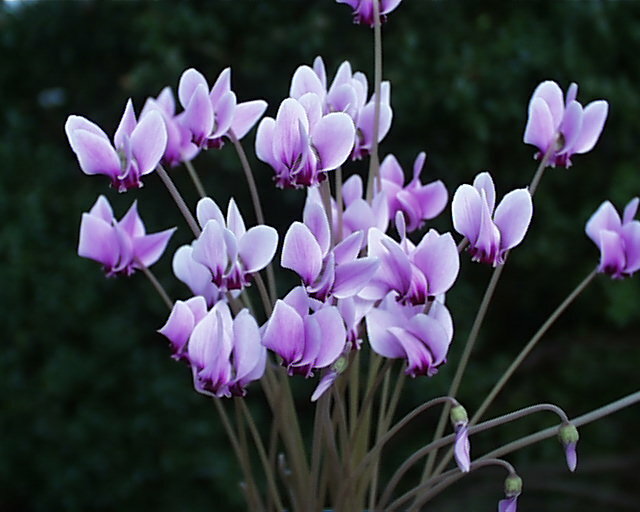 There is a wide range of forms in color of the flowers, leaves, and in time of bloom. 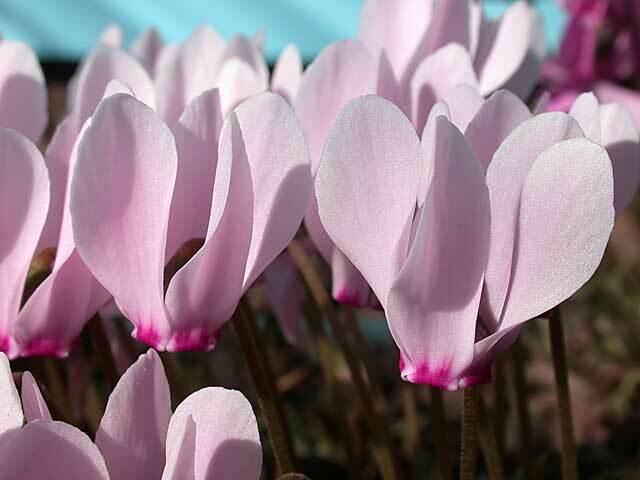 Flowers are usually produced in late summer to autumn just before or with the leaves and if you grow more than one clone, you will find flowering time to vary. 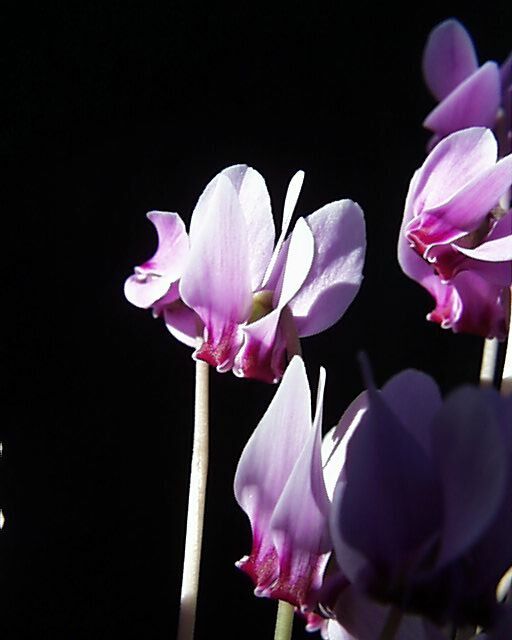 Flowers are pale to deep pink, rarely white, with a double V-shaped purple magenta mark at the base of each petal, and strongly auricled at the base. 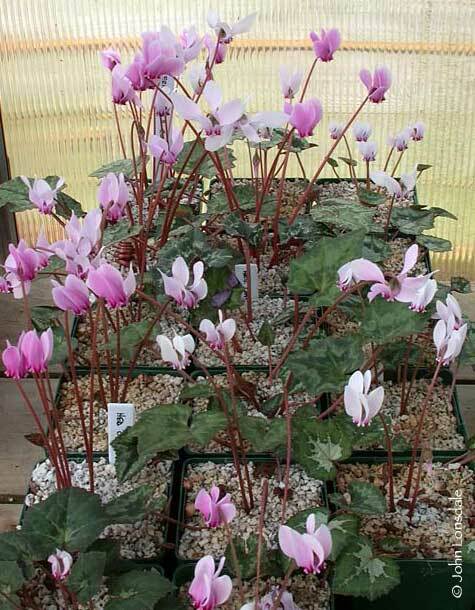 See Cyclamen Compared for comparison with Cyclamen coum. 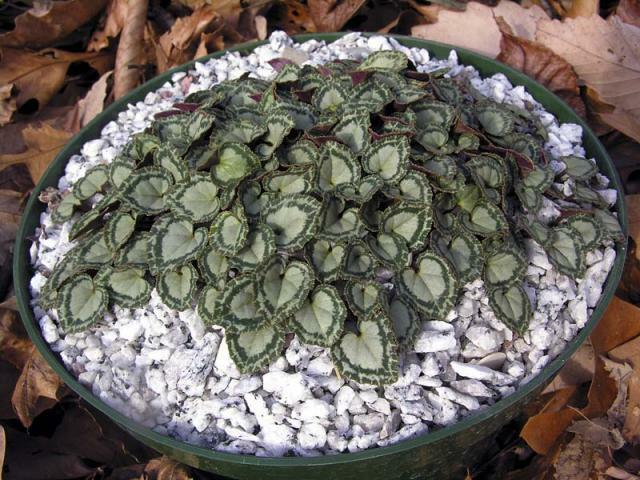 This species is one that is most easily grown and is considered to be the hardiest planted in the ground. 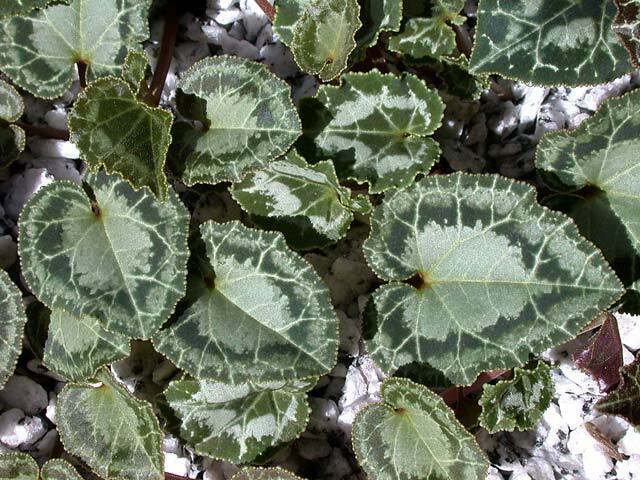 It is easy to grow in sun or semi-shade. 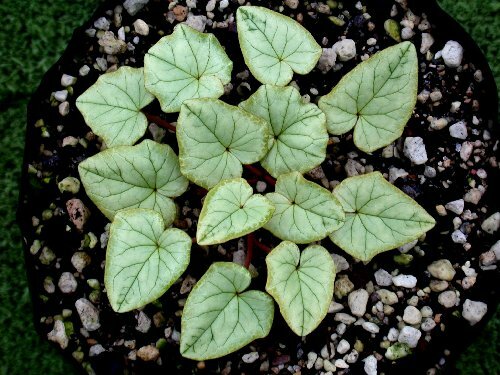 This species can be grown in a pot, but as the tubers expand, it may be difficult to find a large enough pot. The first three photos are by Arnold Trachtenberg, the fourth is from John Lonsdale, the fifth from Mary Sue Ittner and the last by David Pilling. 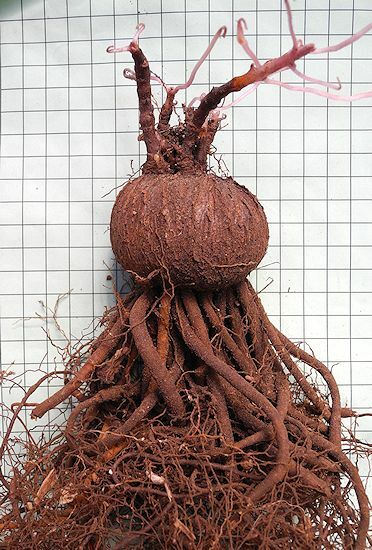 Tubers are depressed-globose, often flat above and can become as large as 34 cm (14 in) and corky and fissured with age and root mainly from the shoulders and sides. Photos 1-5 from John Lonsdale. 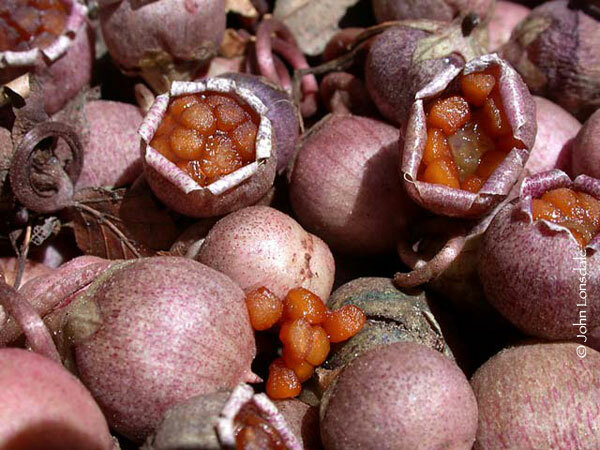 The first two show tubers and the next three seeds and seed pods. 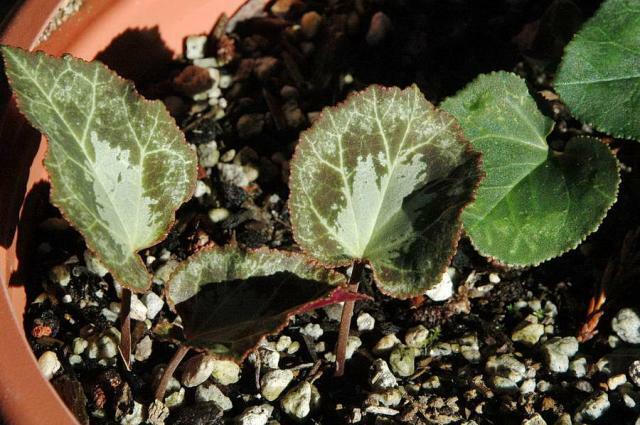 The last photo by GiorgioPozzi shows seeds in different stages of germination late September 2009 . 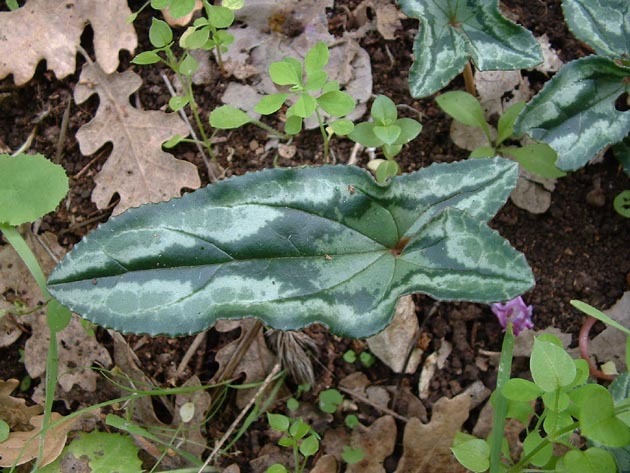 Leaves can be lyre-shaped, oblong, lanceolate, or heart-shaped , with or without lobes and the margin can be faintly to markedly toothed. 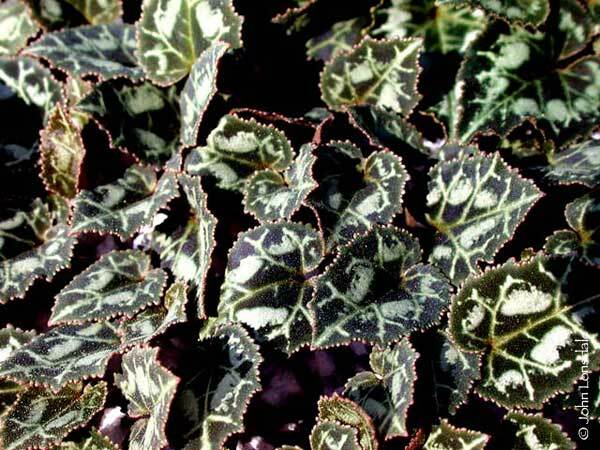 The color of the leaves varies from grey-green with a hastate pattern that is darker or lighter to pewter, silver, or cream. 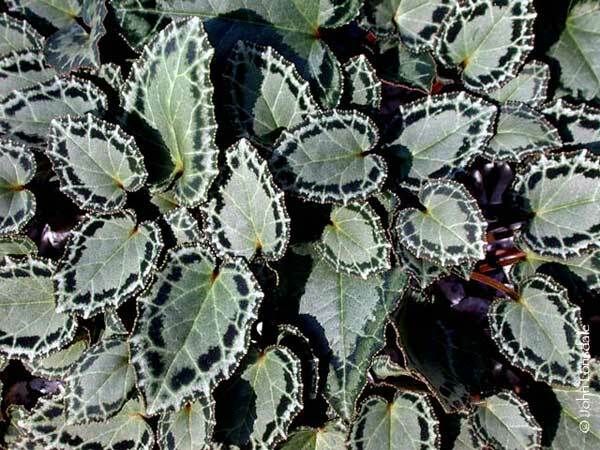 The photos below illustrate some of the wonderful leaf patterns of this species, illustrations of fabulous foliage taken by Bill Dijk. Last picture from Roland and Gemma. 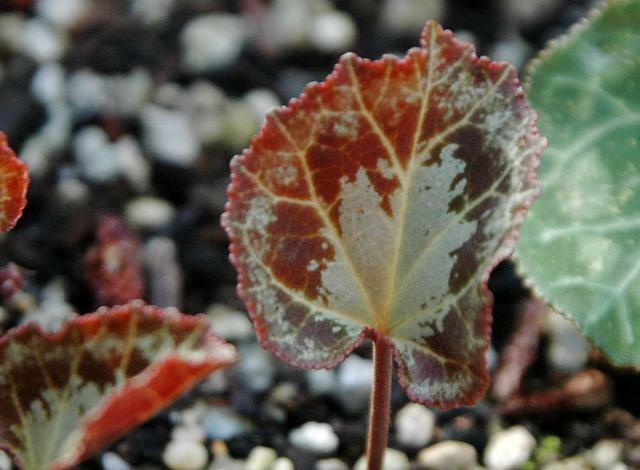 Below are more leaf variations from John Lonsdale. 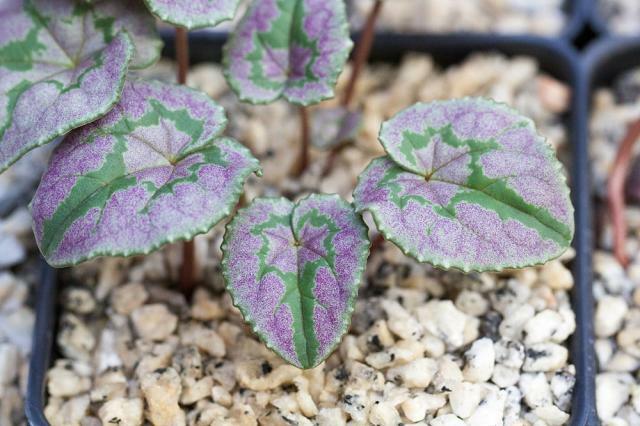 Leaf variations in plants grown from seed. Photos from Mary Sue Ittner. 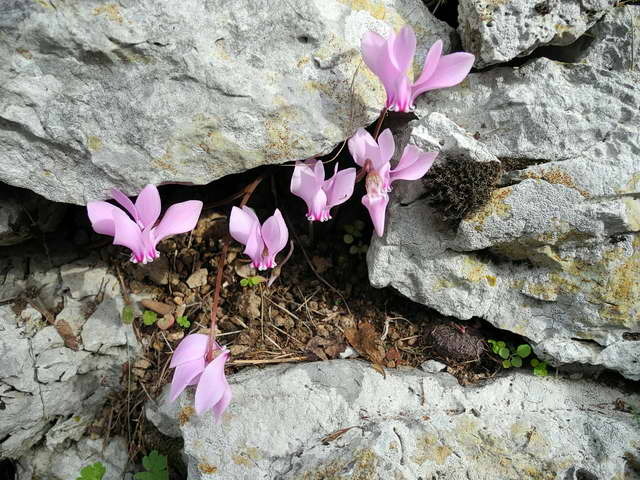 The first two photos below were taken in Corfu by Hans Joschko where this species was blooming in mass, and the third photo illustrates a red flower he found that he is calling Corfu Wine. 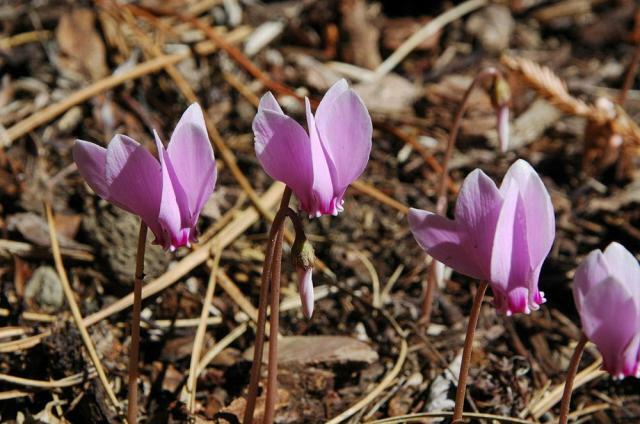 The fourth was taken in habitat in Apulia, Italy by Angelo Porcelli. 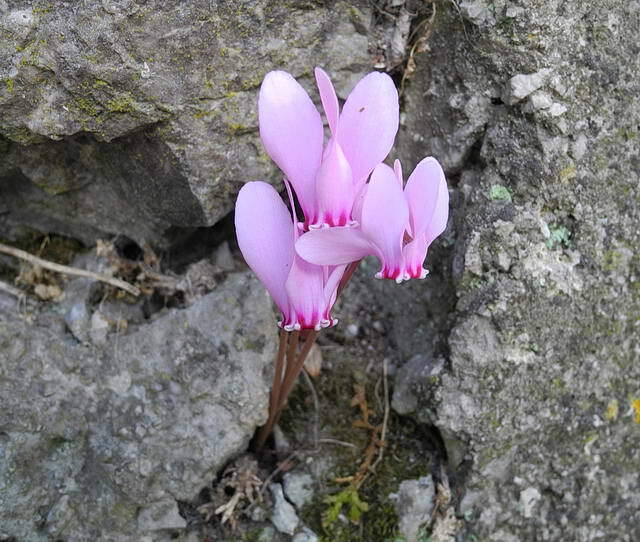 The last two were taken on the Amalfi coast, Italy by Mary Sue Ittner where they were blooming in rock crevices. 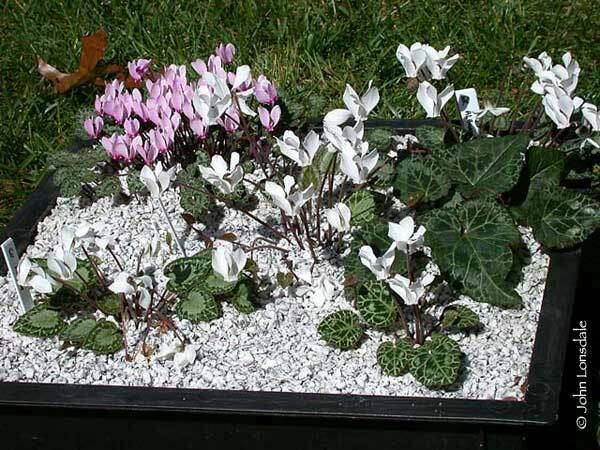 White flowered forms are generally referred to as Cyclamen hederifolium var. 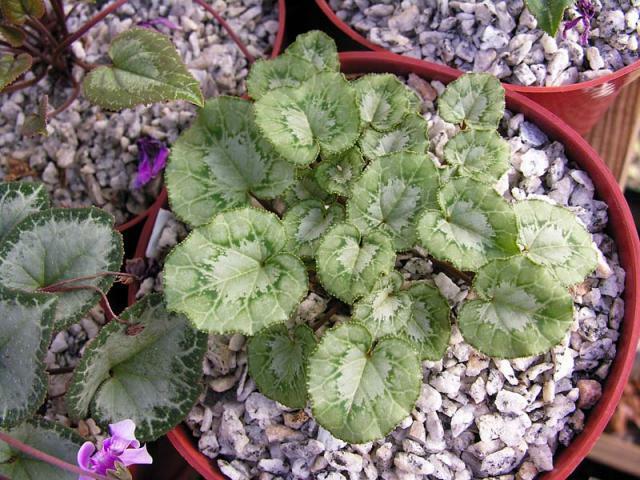 album or since this variety was never published Cyclamen hederifolium 'Album'. 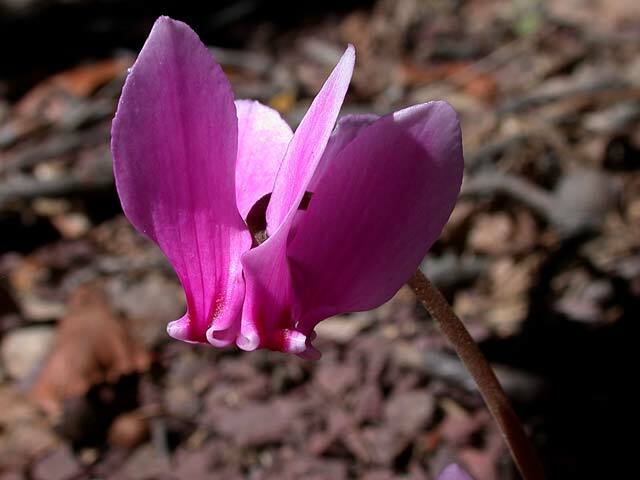 A species was published as Cyclamen albiflorum however. 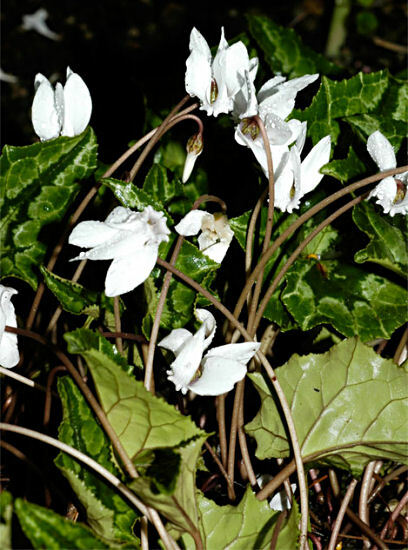 Since that species is now considered to be Cyclamen hederifolium Grey-Wilson has published the white form as Cyclamen hederifolium forma albiflorum (Jord.) Grey-Wilson. 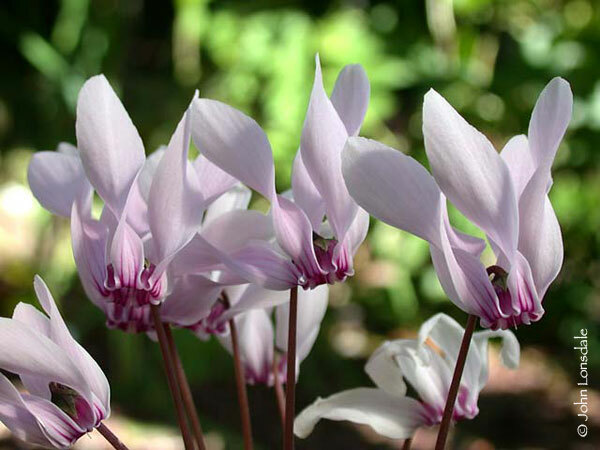 This form has big tubers and light sweet pleasant fragrance. The first three photos by Giorgio Pozzi. 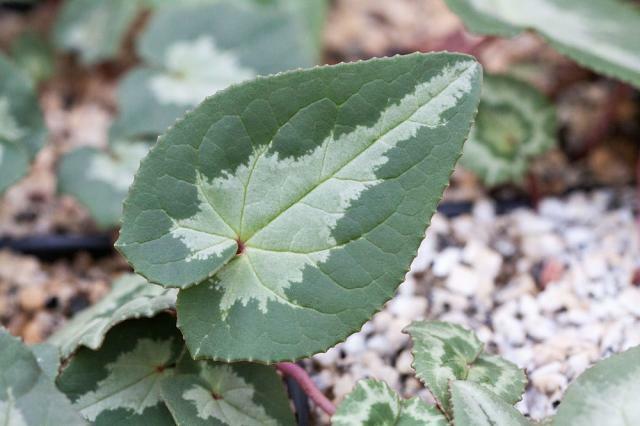 The fourth photo from John Lonsdale shows a plant with white flowers with pink markings. 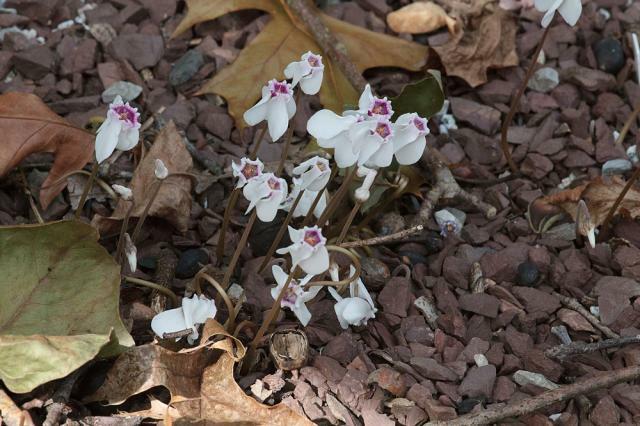 The last photo from Mary Sue Ittner illustrates that white forms can turn up when you grow this species from seed which may be why some sources do not elevate the white form to variety status. 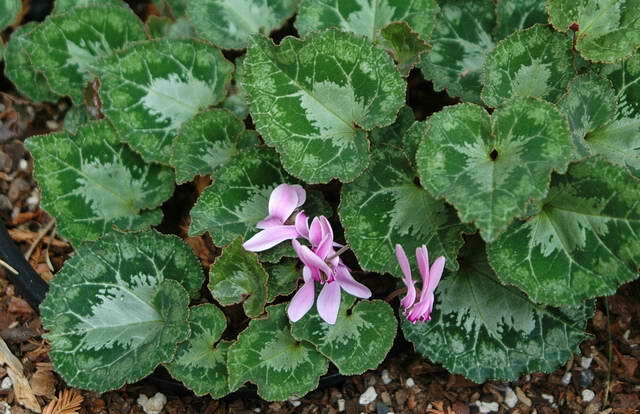 Cyclamen hederifolium var. confusum Grey-Wilson, syn. 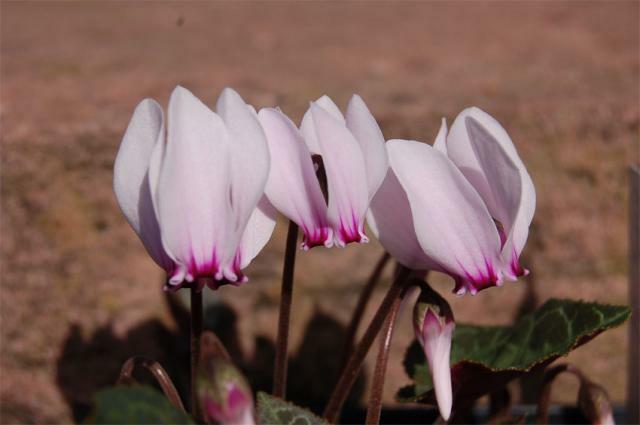 Cyclamen confusum (Grey-Wilson) Culham, Jope & P.Moore, is a tetraploid variety which occurs in the southern extremities of the species range. 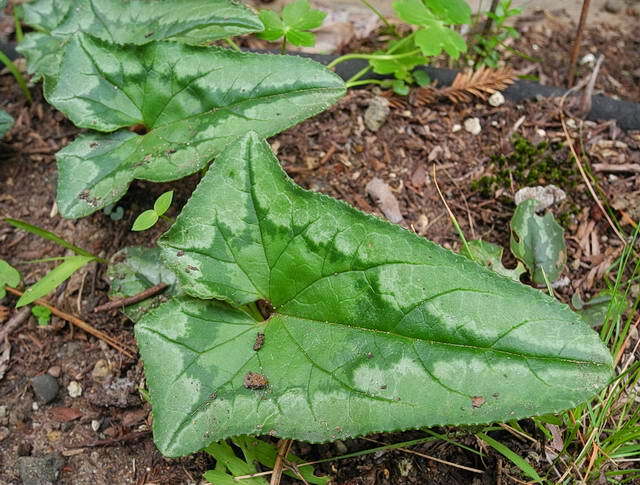 This variety has shiny bright green leaves that are thicker and fleshier and described by Grey-Wilson as having a poorly defined hastate pattern and as shallowly lobed with obscure marginal teeth. 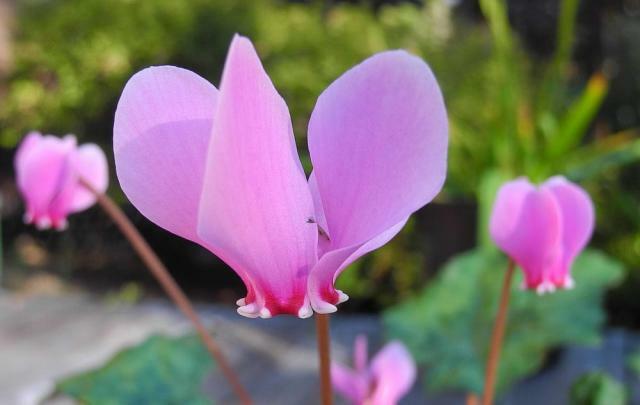 The scented flowers are various shades of pink. The first two photos were taken by John Lonsdale. The next two photos are from Mary Sue Ittner. 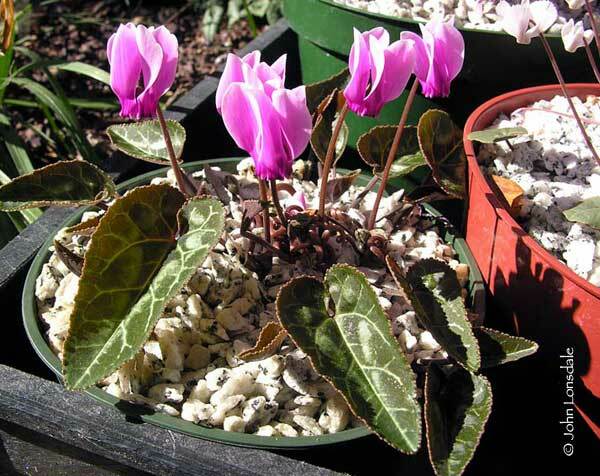 Cyclamen hederifolium var. 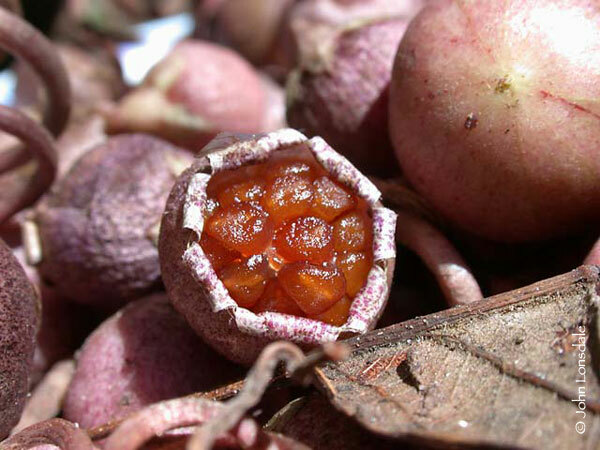 poli is a rarely seen form or variety of this very variable species. 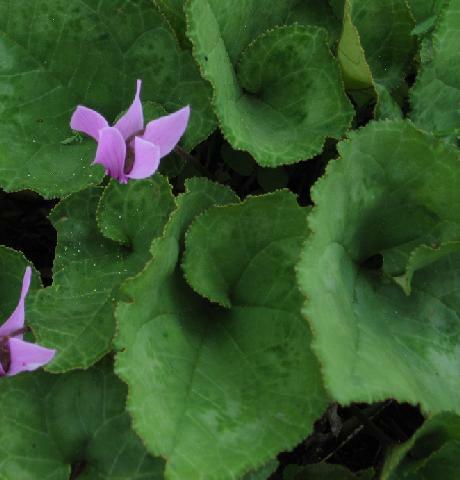 Its sagittate leaves are the main feature, and it is reported to have scented flowers too. 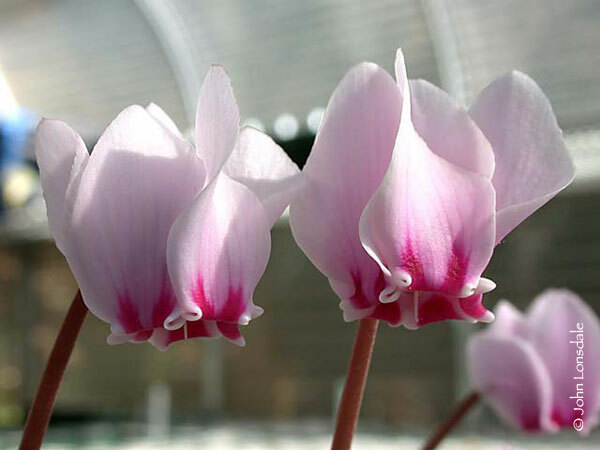 First records of this curious variant were made in the early nineteenth century by Michele Tenore and other Italian botanists. It was formally named by Stefano Delle Chiaje, (1794-1860), whose name is spelled Delle Chiaie in modern Italian. 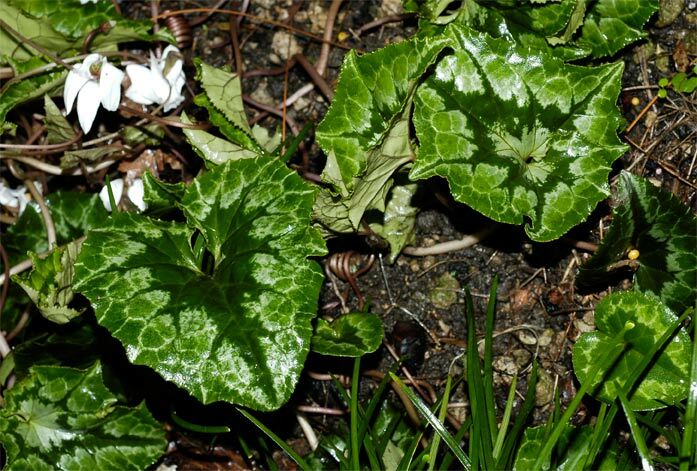 Funny, at that age someone speculated it was a hybrid with Arum italicum ! Photos by Angelo Porcelli. 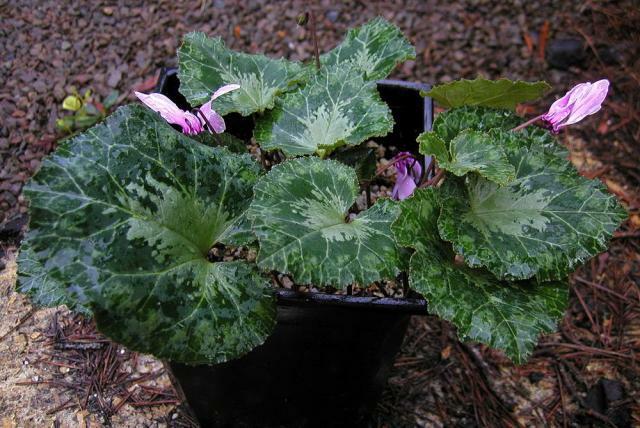 Cyclamen hederifolium 'Stargazer' has upward facing flowers. Photo by John Lonsdale.